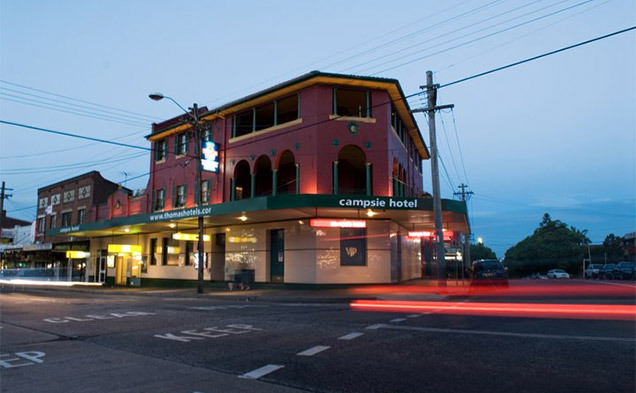 Campsie Hotel is located on the ‘High Street’ of Campsie, this newly renovated pub ‘wows’ all who walk through its doors. Popular with local regulars, keen sportsman & local office workers, the Campsie Hotel caters for everyone making it ideal and affordable Campsie Accommodation. There are 13 rooms at the Campsie Hotel which are clean and comfortable. Each room has a wardrobe, desk and chair, ceiling fan, tea & coffee, bar fridge and toiletries. The rooms we offer are double rooms and a triple room including a balcony. All rooms come with shared bathroom facilities. Enjoy all the great facilities the pub has to offer. The Campsie Hotel Bistro is open seven days a week and offers delightful meals sourced from high-quality local produce. Guests can enjoy their tasty meals in our outdoor dining garden. We also have pool tables available for guests to use in the pub as well as complimentary WiFi in public areas. We also offer full coverage of all NRL and Super Rugby matches so you can catch all the action live with us! The Campsie Station is just a short 5-minute walk from Campsie Hotel, and there are many cafes, restaurants and takeaway shops within walking distance. We pride ourselves on outstanding hospitality, and we look forward to welcoming you to the Campsie Hotel! > Campsie Hotel, Campsie’s favourite local is approx 5 minutes walk from Campsie Station and 30 minutes drive from Sydney CBD. > Enjoy a lovely bike ride along the Cooks River Cycleway. The ride starts at Settlers Park in Ryde through Gough Whitlam Park and finishes at Botany Bay. There are also great BBQ and picnic spots along the river. > The River is 23km long and boasts beautiful scenery and wildlife. If you can’t make it all the way to the end, get at least halfway to see beautiful Gough Whitlam Park. > Belmore Sports Ground is a 22-acre sports ground and this multi-purpose stadium built in 1920. Co-tenants of the venue include the Canterbury-Bankstown Bulldogs and Sydney Olympic Football Club. > Peace Park: The park features a water tower, children’s’ playground, picnic facilities and is the perfect destination for a day of relaxation.